My day spent in the countryside outside of Siem Reap was an experience I will never forget. This was my third trip to Siem Reap, Cambodia, and while I was excited to explore the temples and awe-inspiring ruins of Angkor once again, I was also eager to have an authentic and more personal cultural interaction during this visit. To accomplish this, my colleague Jenny and I planned a visit to Kompheim Village, a small village made up of mainly farmers and migrant workers approximately 10 miles outside of Siem Reap. Our day started when our guide escorted us from our hotel to the local market closest to Kompheim Village. We were the only foreigners in sight, and the market was alive with activity! Everything from fresh seafood to beef, chicken, turtles, snakes and so much more was being sold here. There were also separate areas where items were being fixed and seamstresses were sewing. If you lived in this village, this market was where you came for breakfast or lunch, shopped, had your clothes tailored and caught up on any local gossip. It was a fascinating experience just to wander through the market and listen as our guide explained all that we were seeing. He seemed to know everyone there, and he happily purchased several different locally-made snacks for us to try. Near the market, we stopped at a small Buddhist temple and walked through the rice paddy fields. Along the way our guide shared with us the background on the village, pointed out local plants and even stopped to pick up a huge crab out of the water! We finished our walk to find our next mode of transport, an ox-cart, waiting for us. The ox-cart delivered us to the village, where we would spend the next few hours working. Yes, I said working! Our host family warmly welcomed us into their traditional wooden, stilted home. 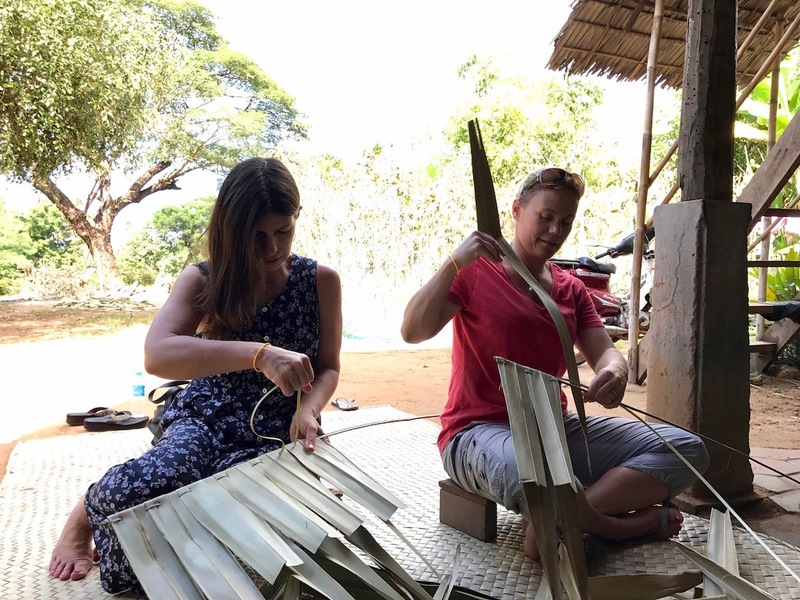 Together, we sat on the floor while they taught us how to weave palm leaves into sets that would be used for the roof of a house. The family makes hundreds of these a day, and we were happy to be there working alongside them as their children and pets looked on at us. After bidding the family farewell, it was off to another part of the village, where we had the opportunity to assist in the preparation of lunch. Chopping up vegetables and grounding up garlic, we chatted away and enjoyed the afternoon watching the village children, dogs, chickens, etc. while our host cooked a local fish, brought in from Siem Reap. It was the perfect end to a perfect day, and one that I know I will not soon forget. Travel Beyond supports the organization that curated this authentic, personal encounter. Proceeds from these tours go into a village fund which is used for special projects to improve resident lives, such as water filters and water wells. Typically, each visit benefits the lives of four families. Our guide was able to personally show us some of these projects, such as a local school where its walls were built from “eco-bricks” of recycled water bottles stuffed tightly together – something I needed to see to fully appreciate. I’m grateful we had the opportunity to spend a day in the Cambodian countryside, visiting the markets, learning weaving techniques and preparing lunch. Still, what will stick with me most are the warm smiles of our local hosts, the feeling of having spent the day helping others and the chance to become a part of the local community – even if only for a day.